Magnificent landscapes, spectacular heritage and delicious gastronomy. Looking for an unforgettable Autumn getaway? Join our Via Francigena guided tour, walking in Tuscany this September. Tuscany is one of Italy’s most visited regions for its unique beauty and history; it is also one of the pilgrims’ favourite sections Via Francigena sections. Departing 17th September, our 7-day Via Francigena guided tour across Tuscany is ideal for those looking to experience the Via Francigena and this wonderful part of Italy on foot, as part of a group of like-minded walkers. The tour takes hikers on the Via Francigena pilgrim trail from the pretty village of San Miniato Alto, Italy’s white truffle capital!, to stunning Siena. Along the way, expect to be amazed by picturesque countryside, taking the famous Tuscan white tracks; and stopping in breath taking historic towns such as San Gimignano ‘of the beautiful towers’ with its impressive medieval skyscrapers. As part of the walking in Tuscany guided tour, the group will be walking manageable distances each day, varying from 13kms the shortest day to 24kms the first and longest day. Manageable distances will allow the group to enjoy a more relaxed pace and give you time to explore the towns and villages after your walk. DAY 1: Arrival in San Miniato and dinner with the group. DAY 2: Walking 24kms from San Miniato to Gambassi Terme. 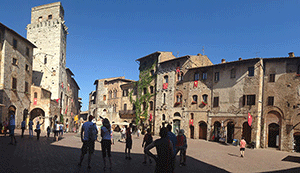 DAY 3: Walking 14kms from Gambassi Terme to the UNESCO-listed medieval town of San Gimignano. DAY 4: Walking 13kms from San Gimignano to Colle di Val d’Elsa. 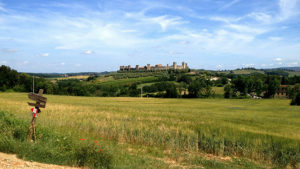 DAY 5: Walking 14kms from Colle di Val d’Elsa to the picturesque walled village of Monteriggioni. DAY 6: Walking 21kms from Monteriggioni to historic Siena. 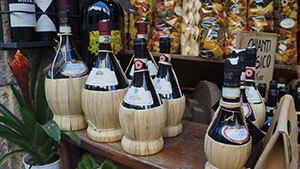 Explore Siena and enjoy dinner with the group to celebrate your achievement. DAY 7: Last day of your tour, after exploring beautiful Siena. See the full itinerary here: Via Francigena to Siena. Our 7-day Via Francigena guided tour departs 17th September. Price starts at €790 per person sharing, including half-board accommodation for six nights, English-speaking guide, luggage transfers and holiday pack with route notes. If you require a single room or additional nights, please let our travel consultants know and they will be able to adapt the itinerary for you. For more information about the Via Francigena, walking in Tuscany or to book your place on this guided tour, contact our travel specialists.